The ER21 development kit provides a very low cost solution for internet and wireless-enabling real-time systems. THE ER21 microcontroller development kit from Iosoft provides the first reference design for interfacing PICmicro microcontrollers to 802.11b - including a lean web server. Developers of products such as home appliances and vending machines can now incorporate 'anywhere, anytime' duplex connectivity for monitoring, troubleshooting and upgrades - using the dominant wireless networking standard. 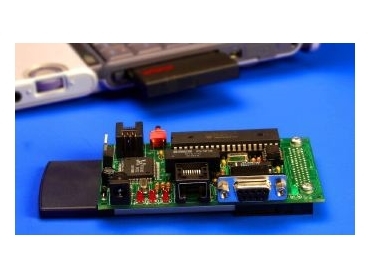 The kit is a combination of a PCB with a PIC18xxx family microcontroller with Flash memory, in-circuit debug connector, and Ethernet and serial interfaces, linked to a commercial PCMCIA card for the 802.11b wireless network. The kit comes with a circuit diagram, and comprehensive software support in the form of Chipweb Wireless - a new variant of Iosoft's lean TCP/IP protocol suite for microcontrollers. Developed over three years, the software provides a comprehensive range of connectivity protocols including TCP, IP, UDP, DHCP, HTTP, SMTP and POP3. These protocols allow users to implement connectivity with features such as a web server, email capability and high speed data transfer, in forms optimised for the small memory arrays available on microcontroller products. Typical stack sizes are around 8 kwords. This is 50 per cent of the program memory space on a PIC18xxx microcontroller (MCU) - assuring developers of the ability to perform both control and networking requirements with ease. Full source code and a license for unlimited use in embedded systems are available for a one-time payment. For versatility of application, ER21 allows PICmicro-based embedded systems to communicate in 'ad-hoc' (IBSS) or 'infrastructure' (ESS) Wi-Fi modes. IBSS or Independent Basic Service Set provides peer-to-peer connectivity, and is suitable for very small networks. ESS or Extended Service Set networks are more common and use radio hubs - known as access points - to co-ordinate traffic, maximising reliability and minimising power consumption. Access points can also act as gateways into conventional Ethernet networks, allowing transparent communication between wired and wireless nodes - allowing any existing network software to be used on a wireless LAN (WLAN) with zero changes. A key feature of the protocol suite is the provision of a lean HTTP web server. It supports multiple connections, forms for simple remote configuration, and dynamically updated HTML web pages. As supplied, the web server automatically provides an example web page showing Wi-Fi network and channel ID with the dynamic status of the wireless link using the signal strength indication provided by the PCMCIA card. Another useful feature for embedded system developers is support for DHCP (Dynamic Host Configuration Protocol). This provides a convenient means of managing and administering systems in the field, allowing systems to automatically obtain a temporary address on boot-up. The software additionally supports the use of the Wired Equivalent Privacy (WEP), with the extended encryption keylength of up to 128 bits, providing security for embedded systems against attempts at unauthorised access. The potential bandwidth of Wi-Fi is up to 11 Mbits/sec, with slower rates down to 1 Mbits/sec employed as an automatic fall-back in the event of interference. The transmission range of the standard is up to around 100 metres.